A free paper trading account or stock market simulator is an excellent alternative to a brokerage account and a big advantage for investors in general, but an ultimate benefit for any day trader. Whether you plan to trade stocks, futures, options or forex – a ​paper trading account is the perfect tool in building a solid foundation for your successful trading career. There are many advantages that come with paper trading and stock market simulators, as well as some major down sides you should be aware of. In this article, I will reveal the most important facts and list the most interesting demo accounts available right now. What is ​a Paper Trading Account? How to know what and when to trade? What will happen once you switch from your ​paper trading account to a real trading account? ​A good ​paper trading account provides you with the same functionalities and features as a real trading account. But there is one important difference. You are day trading with virtual money instead of real money. Trading virtual money with a stock market simulator allows you to gain trading experience without putting your capital at risk. ​​Charts: Visual confirmation is a must for any day trader and swing trader. ​Datafeed: Real time, or at least near time, prices are helpful to simulate real market conditions as best as possible. ​Trade Reports: Important for documentation and your learning process. No trade reports, no good learning curve. ​Watchlist functionalities: List your most interesting stocks, options and forex pairs in one table and compare them based on different columns like price, gain, change, gap or volume. ​Low cost: not really a functionality but a general rule of thumb. ​Optional: Backtesting capabilities: Actually, most demo accounts do not have this feature but tools like NinjaTrader and Trade Ideas do. Backtesting strategies give you an immediate overview about the efficiency of a past strategy. This can help with evaluating the right strategy. Your ​paper trading account will be funded with virtual money only. As with computer games, a virtual ​paper trading account has a major pitfall. Computer games allow you to restart your game whenever you want. ​Paper trading accounts provide you a similar functionality and in most cases you can reset your account balance as often as you want. Real life is different. If you lose money in real life, then someone else has it. In real life you cannot hit a magic button allowing you to reset your account. Instead, you have to put more funds into the account. Trading strategies are one of the biggest hurdles for new traders. Where to start? What pattern to trade? When to buy and when to sell a stock? Stock screeners like Trade Ideas Pro A.I. help you to have the right trade idea at the right time. Take a look at the trade ideas review to learn why Trade Ideas Pro A.I. is the perfect tool for any day trader and investor. 1) Perfect for self-learning: A ​paper trading account can give you a much more realistic picture about the financial markets than any trading course can. You will understand the market structure and price action. 2) Risk-free trading: Buying and selling stocks, options, forex, or even cryptocurrencies is dangerous for your pocket if you don’t know what you are doing. A ​stock market simulator protects you from any losses. 3) Risk-free trading strategy exploration: Making money trading the financial markets is not an automatism. You need a good trading strategy to make money. Most beginners are undecided about which way to go and often jump from one strategy to the other. With paper trading, trading strategies and trade ideas can be explored and tested without risk. Platform handling experience: You will learn the process of how trading works and become a master in handling the trading platform. This is a solid foundation for your trading career. Using a trading platform from your online broker will give you an additional benefit through which you will learn how to execute, buy, and sell orders right from the order screen within the trading platform. Once your ​paper trading account becomes a real trading account, this will be a huge benefit. 4) Mental attitude: Losses are part of the game. Your trading strategy and preparedness could be as effective and perfect as possible, but there will be days when you have the feeling that everything went wrong. The demo account will protect you during the learning phase to handle such losses. You will gain more self-confidence when you recover from losses with the right strategy. Have a plan, stick to your plan and trade with your plan. 1) Not 100% realistic order executions: The buy and sell orders you generate are not transmitted to the financial markets. Therefore, your orders do not have any impact on order executions and market liquidity. In real life, your orders will have an impact and the order execution could be different. Usually, your ​paper trading account executions are declared more favorable than they would be in real trading accounts. 2) Fee structure not transparent: Trading in real life will trigger fees that have to be paid to your broker, the stock exchange, the bank and more. Your ​market simulator will never be 100% transparent and correct in terms of your total fees. Always expect that your fees will be higher once you trade for real. 3) ​Paper trading is not 100% free: The closer a paper trading account comes to realistic trading environments, the more expensive the demo account becomes. If you want to use real time data, then you have to pay for it. If you need a brokerage API for testing purposes, most vendors will charge a fee. Completely "free" accessible demo accounts are full of advertisements to refinance the cost of the vendor or have only low-level functionalities and data. It is an old saying but also a true one, "you get what you pay for." ​Here are my favorite demo account and trading tool solutions ​to practice trading. General rule of thumb: If you don’t make money in your risk-free trading account, you will never do so in a real account. Once you make your way to a real trading account, you will be faced with even more challenges, making it harder to make money. Many ​paper trading accounts come with a virtual amount of $100,000. The average amount of a real trading account is much lower. As a result, you will have less buying power. When beginning, use the demo account settings to adjust the virtual money value as close as possible to your upcoming live trading value. And please be aware that you cannot reset your real money trading account with one mouse click. Only an additional deposit will give you additional funds. A spread is the difference between Bid and Ask in the order book. Trading stocks or financial instruments with high spreads is not a good idea. Within the ​paper trading account you might get your order filled at a very unrealistic price level. In real life you might not get an execution due to some order book magic. However, this part is complex and I will dedicate a separate blog post to this topic. You will experience less favorable order executions during real trading than you would during the demo account. The real market is harder than trading with virtual money. Using the right order types will protect you from uncalculated losses. Within most ​free paper trading accounts your buy and sell orders will be executed 100%, whether you order 1,000 stocks or 10,000. Market liquidity will be ignored in most ​simulated accounts. Trading with a real trading account and real money will put you in the position in which your order will be filled only partially. Imagine you trade a stock that has an average trading volume of 20,000 stocks per day. You alone could generate a buy order of 10,000 stocks at market open. Ouch! Trading stocks, options and futures as a primary instrument will put you in a comfortable situation so that in most cases a deal rejection would not come true. If you consider trading CFDs for stocks, forex or even binary options, then you will be faced with the deal rejection issue. Simply put, if the broker has a feeling that you could get a price where he would lose money, then he will reject your order. This happens because CFDs are not an original financial instrument and brokers want to protect themselves as much as possible. The best way to avoid such things is simple. Do not trade CFDs and other exotic financial instruments. Interests, dividends, cash transactions, deposits, withdrawals and many other things can cost additional money. It depends on your broker what additional costs could arise. Make sure to check the terms before you open a brokerage account. I know, you are probably saying to yourself, "no, not me," but I assure you it will happen. Be ready! Turn the computer off if you have a bad day. Don’t let emotions control your trades. Day trading requires knowledge and a ton of practice. A demo account is the perfect choice for any beginner. 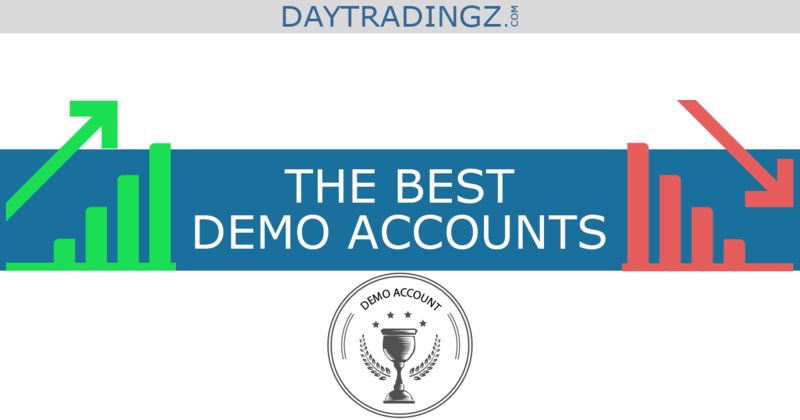 Even experienced traders are sensible enough to use a demo account for evaluating new trading strategies. As I mentioned above, using real life to learn day trading, buying and selling stocks, options, futures and other financial instruments will be extremely challenging. ​The ​paper trading account gives you the ability to gain experience in handling your trading platform and it is a great chance to practice the know-how you acquired while attending a trading course. ​Wise preparation, along with a continuous development and improvement of skills are important for long term success. ​Once you are ready to trade with real money, you will be well prepared with the right trading strategies and loads of self-confidence. This is the perfect foundation for long term success when trading the financial markets with real capital. It is not that crucial if you decide to start with a demo account from an online broker or if you are using a standalone trading tool. The most important thing is that you start practicing with paper trading within a demo account or with a stock market simulator. Plus, a stock screener like Trade Ideas helps you to keep track of the financial markets right from the start and to specifically search for stocks that meet your chosen trading strategy and selection criteria.